In five years, we will be in sight of 2030, a make-or-break date for global sustainable development ambitions. This is our moment to step up and go further. IIED's research takes valuable local solutions to influential global forums, achieving impact at many levels. In a fractured world our network of partners brings together the missing voices and evidence that policymakers need to make the right decisions for people and planet. From now to 2024, we will play our part to make change happen. We will help vulnerable communities achieve climate resilience and development, simultaneously pushing hard for global action to restrict planetary warming to 1.5°C. We will promote biodiversity alongside social justice, ensuring the women and men closest to the land, ocean and natural resources are heard. Our work towards healthier, more secure urban futures will emphasise community agency for truly 'local to global' outcomes. From big business to local entrepreneurs and public sector regulators, we will bring a breadth of vision and experience to bear on fairer markets. And underlying everything is our commitment to increasing equality – lived through how we work as well as the results we achieve. The unprecedented crisis we face – accelerating disruption to the climate, natural world and lives of the most vulnerable people – demands immediate and extraordinary responses. But despite the early promise of the Paris Agreement and Sustainable Development Goals, nations are not yet coming together for a better future. Increasing nationalism and xenophobia mask destructive interests that threaten both planet and people, eroding the solidarity needed for effective global action. And time is short: from the climate crisis to biodiversity loss, any delay in reaction is potentially catastrophic. With multilateral governance under threat, new actors will increasingly set the agenda for development action in the private and public spheres. Social activism will provide more of the momentum needed to confront global challenges. IIED’s growing global network, ranging from multilateral institutions to citizen-led social movements, is positioned to ask and answer the most challenging questions and bring radical, locally tested solutions to the forefront of global policy. In developing this strategy, we consulted our partners, analysed the changing context we work in, and reviewed the last five years. We identified the areas where we can make our best contribution to reducing poverty and inequality, ensuring a liveable climate and preserving the natural world we need for a mutually prosperous future. Alongside this, we designed a comprehensive Learning and Impact Framework: this essential tool will allow us to track progress, learn continually, and adjust our strategic course as necessary. At IIED, we are committed to play our part in resolving complex and connected global crises. We look forward to working with you to build a fairer and more sustainable world. IIED has a history of rigorous and original research that helps drive progress by taking proven local solutions to influential global forums. Our projects make a tangible positive difference in the policies and practice that shape the everyday lives of marginalised women and men, based on their own priorities. Our theory of change ensures we will deliver solutions that come from the bottom up, are grounded in context and apply local evidence. In turn, that local action shapes workable and effective policy and practice. 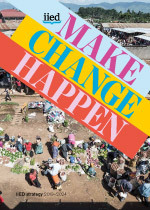 From 2019-2024 we will develop specific programme-level theories of change that will ensure we are agile enough to meet the needs of a changing context, assess the effectiveness of our work and make changes where needed. And we will build on the four 'impact pathways' that have guided our work over the last three years. As our research and ideas support others to tread more lightly on this earth, we recognise that our own activities also need scrutiny. We are committed to minimising harmful emissions, waste and use of natural resources throughout our operations. Specifically, we aim to reduce our greenhouse gas emissions by an average of 2.5% per head annually, consistent with globally recognised reduction commitments and our own ambitions for a safer world. And our ambition to advance our environmental targets and practices means we will keep them under review throughout this strategy period. As isolationism and hostility to media threaten progress, our communications will focus on increasing informed influence and citizen agency. We will take an ambitious approach to engagement and listening – building our communities, strengthening current relationships, creating new connections, increasing media presence, sharing what we know – all with a view to making a difference on issues that matter. Partners remain at the core of our strategy, and as IIED will be bolder and louder, we will support our partners to gain the same visibility. Closer audience targeting and nurturing greater presence on key issues will build our influence by placing our research in the right hands at the right time. IIED works at the intersection of social and environmental justice – where poverty reduction meets climate action; where the preservation of the natural world meets the need to protect local natural resource rights underpinning thriving communities. We have identified five global challenges that we will address in our work: increasing inequality, the climate crisis, an assault on the natural world, increasing urban risk, and unsustainable markets. These challenges are linked; so are the actions we will take to drive change. As we take forward the work programmes outlined below, we will look for connections, synergies and lessons that enable us to enrich partnerships and deliver greater impact. Select one of the five global challenges we have pinpointed below to see our priorities for action in that area over the next five years. The struggle for greater participation, rights and equality underpins every challenge we address. Accelerating elite wealth and growing inequality is undermining global solidarity and commitment to a shared future. Climate change, disruption to the world of work and disparities in access to digital technologies – if unchecked – will increase inequalities in income and power. In many countries, democratic freedoms and spaces for civic activism have declined. Women, as well as young, indigenous and disabled peoples, are among those who too often go unheard. A determination to promote inclusion and justice runs through everything we do: informing how we work, where and with whom. Global responses lag behind essential action as climate impacts are powerfully felt in the world’s poorest nations. The countries responsible for driving climate disruption must act urgently to curb emissions – exceeding anthropogenic global warming of 1.5°C will spell disaster. At the same time, more climate finance is crucial to support poorer countries to build resilience and effect their own green transitions. We will work with policy and research partners to redress the balance by helping vulnerable communities in low- and middle-income countries achieve climate resilience and development – and by pushing hard in every arena we can for ambitious global climate action. We are in danger of losing the struggle to protect vital biodiversity, on land and in the ocean. A false choice between people and environment is causing many conservation efforts to overlook communities and lay waste to local livelihoods, as well as failing to protect wildlife. Meanwhile, agribusiness, extractives and other investment projects often take an aggressively short-term approach. Across the world, people who co-exist with and rely on natural resources – terrestrial and marine – see their rights and livelihoods eroded. Environmental justice is at the heart of IIED. We believe solutions to the untenable pressures on the living planet must also be built on foundations of social justice. This can only be achieved through meaningful engagement with the people who feel the shifts in our natural world most keenly. We know the lowest-income nations will be home to the majority of urban growth over the coming decades. Increases in existing populations and the arrival of men, women and children will swell the cities of Africa and Asia. Climate change and conflict will play their part in mass movement. But these nations often lack the institutions and infrastructure necessary to counter the poverty, social exclusion and unhealthy environments that too often accompany dense, spiralling populations. The Sustainable Development Goals and the Paris Agreement cannot be achieved without towns and cities that are inclusive and resilient. Our work in this area delivers on multiple fronts, placing local agency at the forefront for truly local-to-global impacts. From small family businesses to corporates, the private sector is struggling to keep pace with a host of global threats. Too often good intentions fail to deliver real benefits for people or the environment, as businesses lack full knowledge of the supply chain or the realities on the ground. Governments are also being challenged: to count the true environmental, social and economic value of working with nature rather than exploiting it, from forests to fisheries. And until more equitable markets that preserve vital resources are a reality, our efforts to reduce poverty, combat climate change and protect biodiversity will suffer. Transitions to a more sustainable and inclusive economy must address social, environmental and economic dimensions – this is crucial if we are to deliver across the Sustainable Development Goals. We will build on our work to ensure that government and private sector policymaking treats inclusion and equality as central concerns, and that economic decision making fully includes the value of natural capital. We will further develop this strategy over the next five years. And by continually reviewing the changing policy and political environment, we will identify new issues to influence as well as specific opportunities where IIED can have powerful impact.